Melinda filmed these videos for US Figure Skating, and she thought they would be useful for the general public. They consist of 2 forms of a bridging exercise and 3 balance exercises that are progressive in difficulty. All 6 exercises are aimed at increasing knee, hip and core strength and stability. We’ve just created a new collection of videos with taping techniques. It includes corrective and supportive taping techniques for the hip, knee, and foot/ankle. Coming soon: ankle taping. These rotator cuff stabilization exercises are a more functional way to strengthen your shoulder to both heal and prevent rotator cuff injury. All movement must be performed without increased discomfort to be safe and effective. We’ve launched our YouTube channel! First up, an active, dynamic warm-up for skiers and snowboarders to help prevent injuries. 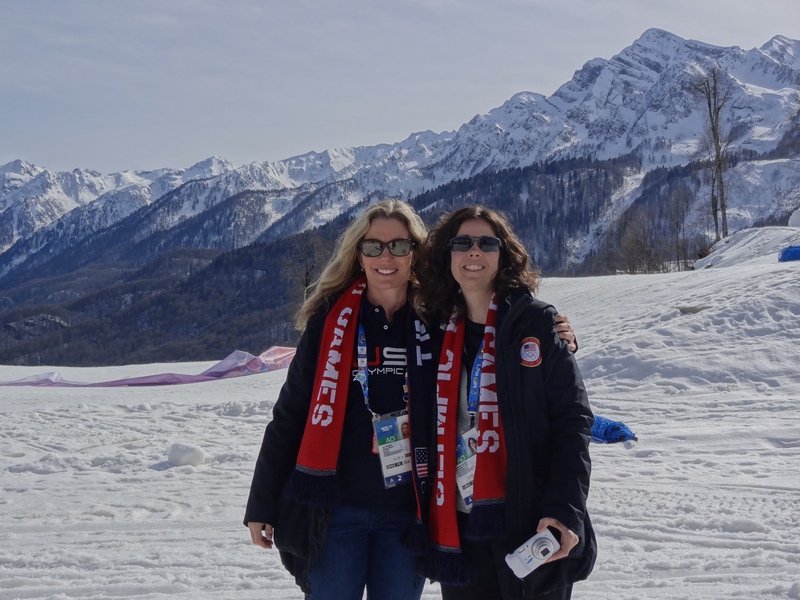 Hot off the presses: our Spring Newsletter: Melinda’s Olympic Experience in Sochi. Also, the February 2014 issue of PT in Motion features a story about Melinda. Correction to article: Melinda has worked for US Figure Skating for 15 years, not 5 years. Preparation for these Olympic Games was a daunting task. We wanted to be ready for anything we could do to help our team have a great time and perform at their best. As we prepared, we considered so many scenarios and asked so many questions of those who had “been there” before (Thank you!!!). The media and lack of detailed information from the LOC, of course, fueled our imaginations. I don’t know how many rolls of extra tape, Cipro tablets, antidiarrheals, and Tamiflu capsules that we actually had between all of us, but the good news was that we didn’t need it….well we needed some of tape J. What is it like to be behind the scenes at an Olympic Games? First of all, the Team Processing experience was quite amazing. Our first stop was in Munich, Germany. We were greeted by the Awesome Katie McCarter, who took care of all the details while we were there. After checking in, we were driven to the Old Olympic Park. That was cool! It seemed like the perfect way to begin our Olympic adventure. There was a huge warehouse-type space set up as a personal shopping mall for all of Team USA. Each sponsor had a booth: Nike, Ralph Lauren, Hamilton Watches, Oakley sunglasses, USADA and more! We visited each booth and were issued Olympic Village clothing, Opening and Closing Ceremonies outfits, watches, sunglasses, luggage, toiletries from Proctor and Gamble and placed an order for an Olympic ring…it was like Christmas as a kid all over again! We even had our own stylists from Ralph Lauren helping us with sizing and styling of the Opening and Closing Ceremonies attire (good thing too…you never know how we would have styled ourselves). We can tell you first hand that sweaters were beautiful and so patriotic! We heard they were selling for almost $6000 on Ebay toward the end of the Games! Our stylists made us feel pretty awesome as we tried on the off-white pants and pulled our sock up over the bottoms. We couldn’t remember the last time we did that? Maybe 8th grade…or was that leg warmers? Regardless, we had so much fun and felt so proud to wear the clothing and to be a part of the Team. 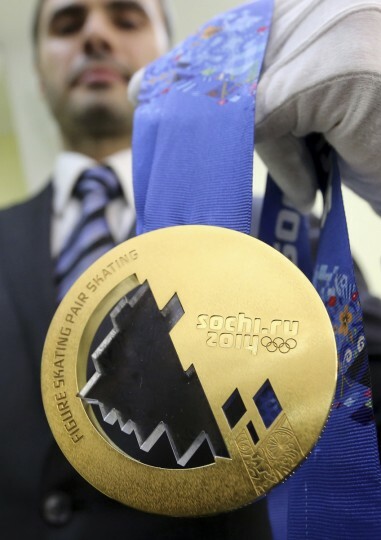 The next morning, it was off to Sochi on chartered flights that were loaded with not only athletes, but with all the various equipment and gear: luge sleds, skis, snow boards, guns and ammunition for the biathlon team, and of course figure skates. We could only image what it must be like to travel with the Paralympic Team! We arrived at the Sochi airport and were met by shuttle buses that escorted us to the Olympic Village. The whole process was so well coordinated and thought out by the USOC. The smiling and encouraging USOC staff were present each step of the way, creating a great sense of excitement and comfort. It was pretty surreal wandering around the Olympic Park and Village those first few days. After quite a bit a rain leading up to the Games and rumors about “mud over your ankles”, by the time we arrived it was sunny and the temperatures were moderate, 50 degrees or so during the day, in the 40s at night. The Coastal Village was located along the Black Sea and Team USA buildings were in the middle of the row of dorms, on the water side. It took a couple of days to “get the lay of the land,” but then it became routine and pretty soon felt like a new home away from home. The USOC Sports Medicine clinic was located in the building right next to us. It was like having the Sports Medicine Clinic from the Olympic Training Centers transplanted in the Coastal Village. They were there as support for us and were a great resource for us and our athletes. The Olympic Village condos were very comfortable. The rooms were big and the beds were comfortable. Due to the forethought and planning of our amazing Team Leaders (Mitch, John and Kathy) the rooms were all decorated with photos from home, American Flags and other decorations were displayed in the halls, our beds were made and the furniture arranged. They even ensured we each had a memory foam mattress topper, extra converters, adaptors, an umbrella and many other essentials. We had a view of the mountains, the Bolshoy (Hockey Venue) and the rest of the Olympic Park. Those living on the other side of the hall looked out onto the Black Sea. It was truly beautiful. The dining hall was a 10 minute walk away. The food in the dining hall was great. There was even a McDonald’s for the occasional McFlurry, like after Charlie and Meryl won their Gold Medal! Of course a day would be not be complete with at least one cappuccino! John Millier became acquainted with the “Pizza Guy” who gladly made special request pizza, including pineapple and ham pizza. He may have started an international phenomenon. The Figure Skating events were held in the Iceberg, one of many new venues built in the Coastal Cluster for this Games, and all located within a 30 minute walk from our dorm. We hope you saw some footage of the Iceberg on TV. It is a beautiful building that seemed to change color throughout the day, sort of the like the light reflecting off the ocean. In many ways, the figure skating portion of the Olympic Winter Games was very much like being at a long World Championship event, just like Judy and Skip told us. The “skating family” was the same with familiar skaters, coaches, officials and team leaders. After several weeks went by, even with few words said between us, they all became our friends. The structure was the same with the medical staff attending practice sessions throughout the day, competition at night and performing various medical and physical therapy services as needed. It was different in that the “figure skating world” was woven in as a small but very special part of a much grander world that surrounded us: The sight and the sound of the Olympic Flame when walking through the Olympic Park, Interacting with athletes and medical staff from other sports in the Park and dining hall, Seeing the vast snow-capped mountains on the horizon and knowing our athletes were competing there as well, Witnessing the best athletes in the world from other sports compete, Watching medals ceremonies in the Olympics Park – Seeing our extraordinary athletes receive the first ever Team Event Bronze Medals (congratulations Ashley, Gracie, Jason, Jeremy, Marissa, Simon, Meryl and Charlie!) and our breathtaking ice dance team receive the first ever Ice Dance Gold Medals (congratulations Meryl and Charlie! ), and so much more. As we sit here and write this, it is even more evident to us just how difficult it is to put this huge experience into a framework of words. We just feel very fortunate, grateful and honored to have had the opportunity to have an Olympic experience and to have been a contributing part of our Team Behind the Scenes! Thank you for all of you for your generous support and encouragement. We still get goosebumps…just thinking about it. Thank you.